I am so sorry to have seemingly fallen off the face of cyber-earth during the ABS Ornament Challenge! My computer contracted a nasty virus just two days before the reveal and I was only able to pick it up from the computer hospital yesterday. Yes, that is actually what the place I use is called! So for now we are up and running again but I have learned not to be too optimistic when my laptop is concerned. May be time for a new one!! So finally here is the ornament I created using Mary Harding's Heart Shape Pine Cone Pendant. I found Mary through one of the many beading magazines I read each month and she is one of my favorite Etsy sellers and has become a really great internet friend as well. Thanks, Mary! I absolutely love this piece and although I originally bought it with plans to make a jewelry piece to sell, I realized I loved it too much to let it go. So for now it will find an honored place on my tree and then after Christmas I think it will find a more permanent home rather than put it away with the rest of the decorations. It would make a great winter decoration in my kitchen. Here's a little sneak peek at the ornament I created for the Art Bead Scene Holiday Ornament Blog Hop. Big reveal and hop is on Wednesday, Dec 7th. But here is just a little peek at what I have created with a beautiful focal piece by one of my favorite ceramic artists, Mary Harding. I just do not like "Black Friday"... I don't like the name, or the idea or the commercialism of it all. I especially do not like the panic that surrounds the whole concept. Have to get to the store before anyone else for the best deals? Like a commpetition. I really do not agree with it. Did anyone else see the lines on the news? People lined up with tents and sleeping bags outside Best Buy to get there first before they run out of 42" flat screens? It looked just like people in other countries lined up for food, clean water and medical supplies. What is wrong with us anyway? And what especially bugs me is what I heard on the news that the stores and the government are hoping we, the consumers, spend a lot this holiday season to stimulate the economy. Why can't the banks and the government play their part in that? Why does it always fall to the little guys like us to "bail" them out? Haven't we already done enough to bail out the banking industry? I refuse to be a part of this whole thing. My family and I have found ourselves in a unique situtation this year. I have been unemployed for a month now and although the week after next I start my new job, we find ourselves without the extra cash we might have had in years past to shop. I have never been a BLACK FRIDAY shopper anyway. But this year especially I will not be doing any mall shopping or big box store shopping. We are fortunate to have a small shopping list this year. Even for my kids I will be making some of their gifts. The rest I will shop for locally in small stores owned by local people whenever possible. My kids are not typical- they don't want APPLE or ABERCROMBIE or anything with a label at all. My kids both love books. My daughter loves pens and notebooks. I feel very fortunate that at this time in their lives and mine we are not slaves to fashion or fad. So whenever possible I intend to give or buy homemade. Try to do the same wherever you can on your shopping list this year. Let's not stimulate the ecomony of BEST BUY or COSTCO or WALMART, if possible. I plan to stimulate the economy of fellow artisans such as myself. 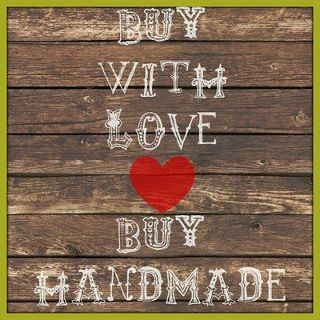 Shop ETSY, or local craft/art fairs or local stores owned by your fellow Long Islanders. Theirs is the only economy I care about this holiday season. What a terrific turnout for yesterday's first annual HOLIDAY OPEN HOUSE. Thank you to all of those people who were able to attend and who brought lots of words of encouragement for my creative endeavors. A very special thanks to my incredible generous friend, Andrea, who opened her home to us and also provided great snacks. It was especially wonderful to touch base with people I haven't seen in a while. I will be listing many new pieces this week in my Etsy shop-http://www.gemrose.etsy.com/ .I am also offering free shipping -just enter coupon code-HOLIDAY SHIP-at checkout. Give me a day or two- although I am officially still unemployed I need a day to gather myself after the weekend rush. I also have a couple of "working interviews this week in the dental world. Wish me luck!There were some people who responded that the date was not a good one for them although they would have liked to attend and I have had requests for another date in the near future to stop by and shop at my home. This is sounding pretty good to me although I am uncertain when might be good for the most people concerned. So leave me a comment and let me know whether a Friday night after work or a Saturday afternoon might work best for you. I will see what is better for most and post the date in the near future. Probably right after Thanksgiving, I am thinking. Thanks for all the encouragement and support- both here and on Facebook. I miss many of you and it is so nice to hear that you miss me too. I am looking forward to lunches with my friends in the weeks ahead. Tomorrow is my first annual Holiday Open House and I have spent the last 48 hours putting the finishing touches on the many new pieces that will be featured. My wonderful friend, Andrea Rizik, has generously opened her home to make this all possible and I am truly grateful. The open house runs from 1-5 on Sunday November 13th at Andrea's house in Lake Grove. I have lots of new pieces and I have really tried to cover a range of styles since I know many of you will be shopping not only for yourself but for friends and family members. This photo features a piece called the Barbed Heart- a rather edgy almost gothic style that might please some of the younger women on your shopping list. 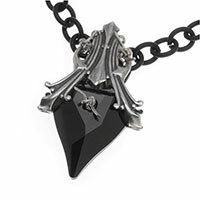 The centerpiece is a 27 mm Jet Swarovski Heart and it hangs on an 18 inch black chain. It is a limited edition piece and I have only 3 of these available this weekend. I hope to see you there but if you can't make it, I will be listing new pieces in my Etsy Shop on Monday morning so please check back there. Also on Monday morning I will be posting right here on my blog a COUPON CODE for free shipping to use in the Etsy store. I am off to make some more pretties. See you tomorrow!! ANDREW THORNTON'S OCTOBER READER'S CHALLENGE REVEAL!! Yay!! Today is the reveal date for Andrew Thornton's October Reader's Challenge Blog Hop! I feel extremely fortunate to have snagged an October Reader's Challenge Kit- you have to be quick and very lucky. They go in a matter of minutes once Andrew lists them. This is the first one I have been in and the colors he chose were a beautiful grouping of blues that reminded him of October skies. October has been unusually cold here in the Northeast and some of us have even had snow and ice already before Halloween. So when I started creating with these colors I found myself leaning towards beads and focals that reminded me of icy fall nights-icy trees, ice crystals, snowy branches and new snowfall on a forest floor. It makes me shiver just to think of it. In addition to using the beads Andrew generously included in this month's kit, I used a "Green Girl" owl, a leaf focal from "the classic bead" on Etsy and a lampworked disc from "Class by Leese". I also added some sterling rings and white chain and finally some "painted threads" to tie it all together. Andrew also included a gorgeous Green Girl skull which I wore on Halloween on a black leather cord bracelet. Just wonderful! It will find it's way to a more permanent home in some new creation of mine in the very near future. Thank you Andrew for this opportunity to create with your personal selections! I will be back to try and get a future kit again! Hope you all like it- now go HOPPING!!!!!!!!!!!!!!!!!!!!!!!!!!!!!!!!!!! ONLY SEVENTEEN MORE DAYS TILL BREAKING DAWN!!!!!! I refuse to make any apologies for being so in love with the whole Twilight Saga. It is elementally the ultimate "bad boy" fantasy love story. And whether you think Stephanie Meyer is a good author or not, it has touched so many people in a truly guttural way. And this picture of Robert Pattinson just sends my heart soaring!! I am a pretty reasonable person in many ways but not when it comes to this one thing. I have 3 tix for the special 8 pm showing on Thursday night, November 17th. And I am not ashamed to say I ran out for the tix at 10 pm a couple weeks ago as soon as I saw the email from Fandango. I didn't want to go to the midnight show alone. (I mean I did but I thought I would feel pretty ridiculous) and then they announced this special showing at AMC theatre in StonyBrook. I have taken an obsession with color and texture and turned it into a hobby/business. I have loved to make things since I was a little girl and I LOVE working with color and texture and bring that love to my designs.